After a week of many trials and tribulations the time had come to throw my kit together, chuck a few clothes and a toothbrush into a bag and set off on the road to Scotland. After Matt picked me up we collected Richard X and squeezed three sets of kit and three divers into the car and hit the M62. Arriving at the familiar Rock House, all the weekend divers piled into the new refurbished kitchen and caught up on the years diving. Diane, Steve, Jill, Kate, me, Matt, Richard X, Richard W, Kevin H, Nick, Syd, Huw and Frankie crammed into the small kitchen area. The topic soon came around to the weather and easterly winds predicted for the morning. Would we dive or would we be blown out, a question only the morning would reveal. After few more bottles of beer and wine bed called and Saturday morning soon came about. Peering out to sea it was clear from the white horse that the sea was a bit “lumpy”. However, it was fine and the wind slight. Skipper Paul cast his experienced eye out to sea and announced “we’re on!!”. Kit and cylinders were loaded onto the boat and all kitted up in the shelter of the harbour. The boat left the shelter of the harbour walls and out into the choppy sea. The boat listed and rolled and powered out to a hopefully sheltered Petticowick Bay. First dive and we’re in. Vis not great, but plenty life could be found. Small flat fish, cuttlefish, dead mans fingers and the usual sea fare were numerous. Back onto the boat heading for the shelter of the harbour and the world famous Cullen Skink. Oh no!! 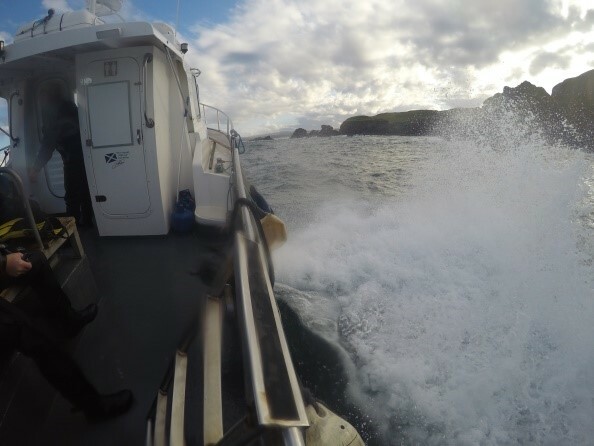 Word arrives of a dive boat in trouble, seemingly the steering has failed leaving divers in the sea. 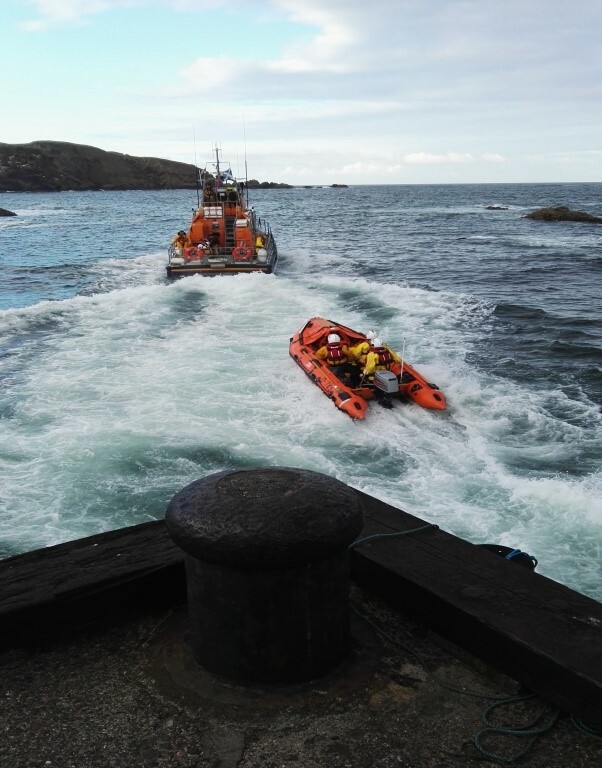 Other dive boats pick up the divers but the stricken dive boat needs lifeboat help. 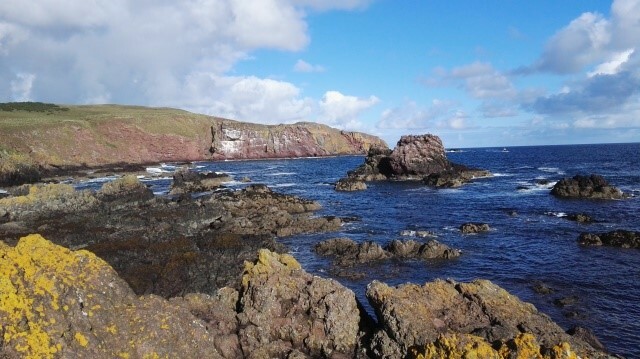 Donate to the St Abbs lifeboat!! Back on the boat for a second dive and the sea hadn’t flattened. Another bumpy ride out to Skells this time. Slightly more exposed the swell had the boat bouncing around. However, falling over ourselves to position over the lift we jumped in one after another and narrowly missing a box jellyfish we all sank onto the sea bed. Once again the life was abundant with soft coral, kelp and anemones. Lobster, crabs and ling could be found lurking amongst the rocks. 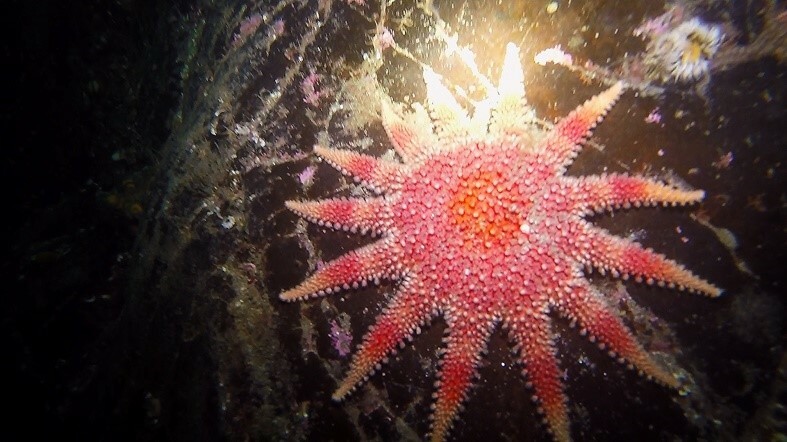 The gentle current pushed you along the gullies and rock formations across the zillion brittlestars and occasional sunburst starfish at around 20 metres. Then the fun begins on surfacing. The swell was, well, a bit rough. Eventually the boat came around and with the lift listing and rolling getting back onto the boat was “fun and games”. With a few green faces we headed back to shore for showers and drinks and prepared for the evening trip to the pub. We all headed across the coastal path to the New Inn in Coldingham for a fabulous meal and one, two, three and perhaps more drinks!! A few of us decided to carry on to the Anchor for Jager Bombs and beer, because we could!! Back to the bunkhouse for a couple of nightcaps and then to bed for the next day’s diving. Sunday morning revealed a bright clear day with calmer seas. Decided on Black Carrs for the third dive of the weekend. Dropping to 20 metres swimming through fabulous gullies covered in dead mans fingers, anemones and sponges of all descriptions we came across an Anglerfish hunkered down on the sea bed. Seemingly not phased by two slightly odd looking divers shining torches over its head, it remained on the seabed curiously peering back. 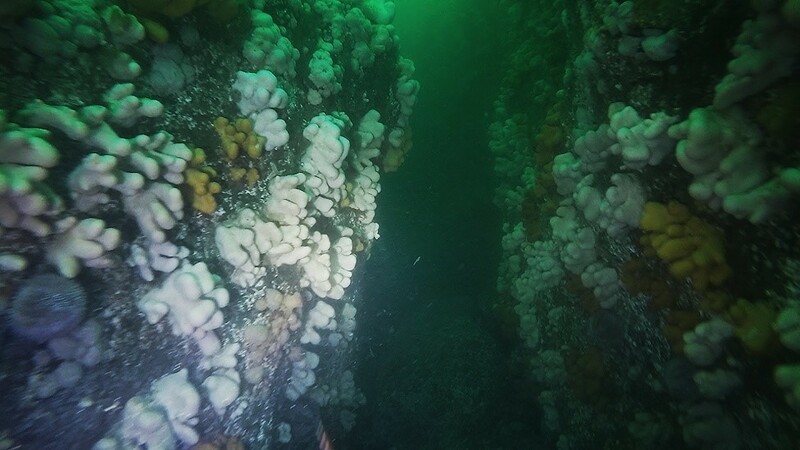 Finally for the last dive we re-visited Skellies and found our way through a maze of gullies and walls covered in sea life, encountering wolfies, ling and cod along the way. A couple reported seeing octopus, however you can’t always believe all you hear!! Sadly that was it, the fourth dive over and back to the harbour for de-kit, wash down and inevitability of the long drive home. However, we got a full weekend diving and beautiful sunshine and great company. Thanks to Diane for organising the trip and hope to see you all again next time.